In the 1940s and 50s when I was a young man growing up in Southern Baptist churches in Washington DC and later in the Northern Virginia suburbs I was heavily immersed in the religious culture that I later knew as Evangelical Christianity. At that time it was generally conservative in tone, non-confrontational and non-political. Christians were expected to live a “Christian life”--and while what that meant was the subject of Sunday School lessons and sermons, there was an ideal held up of a Christian life that involved personal integrity, responsibility for one’s actions, love as the guide to interpersonal relations (which as a practical matter meant understanding our duty to “love” our “neighbor” broadly defined to include the stranger and even our enemy), and following Jesus’ imperative to his followers to house and feed the homeless, the poor and the hungry; to comfort the lonely and the stranger among us; to seek peace, and to do no harm. While Evangelicals were occasionally puritanical and self-righteous, typically they were not arrogant—they merely affirmed that being a Christian was a serious matter that involved being “called” out of the world to live life differently and to model to the world a life that reflected the teachings of Jesus. I was aware that there were other Christians (both Protestant and Catholic) that had quite different beliefs than those taught in our Baptist tradition but they were often dismissed as Liberals or Modernists who were more inclined to “compromise” fundamental Christian traditions and beliefs in an attempt to modernize Christianity to conform to contemporary culture and consequently to make it relevant rather than to keep separate from the world. Something dramatic and unfortunate happened to Evangelicals in subsequent years. Between the “then” and the “now” Evangelical leaders [such as Franklin Graham, Tony Perkins, James Dobson, Pat Robertson, et al.] seem to have lost their way in the thickets of power, influence and money. They built megachurches and religious schools into empires; their megaministers built mansions and drove fancy cars, and they became wealthy and socially prominent. Increasingly enamored by power and money, they found the traditional teachings of Jesus inconvenient and ignored them or reinterpreted them in deference to the requirements of politics. They stood the Constitutional principle of separation of Church and State on its head in order to get subsidies from the public treasury for their religious entities, to limit the ability of civil authorities to enforce laws prohibiting discrimination in public services, and to make certain conduct unlawful on specious religious grounds (i.e., abortion, gay marriage). Evangelicals found common cause with the Republican Party and, that unholy alliance of convenience consummated, both the Evangelical and the Republican leadership used each other to their mutual advantage. With the emergence of Donald Trump as a political force Evangelical leaders dropped any pretense that Christian or moral values played any significant role in their agenda. I have been shocked and surprised at the ease with which Christian values and norms have been compromised and surrendered to the interests of the wealthy and the corporations. When questioned about their capitulation, Evangelicals have an answer, however unsatisfying and shocking in the enormity and depravity of its moral implications—they say it is all about political power, specifically they are supporting Donald Trump and the Republicans to guarantee the appointment of right-wing judges to the Federal judiciary including the Supreme Court. Their objective is to pack the Federal courts with judges who will support a theocratic approach to governance: judges who will support prayer and religious teaching in the schools; who will overturn Roe v Wade; who believe the President is above the law; who will permit the dismantling of governmental regulations that protect our environment, our health and safety, our food and our medicine; who will support corporations and property rights over the rights of individual citizens; who will overturn civil rights and anti-discrimination laws; and who will block any laws that attempt to reasonably regulate firearms. Why they are betraying Christianity is not particularly important The political end does not justify the betrayal implicated by the means, particularly when both the ends and the means are essentially a betrayal of the message and the values of Jesus. There are Evangelicals who know that and are frustrated by their leaders. Over the past several months I have been struggling with how to approach this discussion of the radical betrayal of Christianity by Evangelicals. Earlier this week I sat down and began to write. After several aborted efforts I felt I needed a break and while sitting on my patio drinking my third cup of coffee I turned to the New York Times on my laptop and very quickly one article grabbed my attention. For the next hour I was captivated by the many thoughtful voices of young Evangelicals (and some not so young) who spoke with passion and anguish about their struggle between what was important in their understanding of the teachings of Jesus in contrast to what they were hearing from their Trump-supporting parents and church leaders that seemed contrary to what they had been taught. I have a cousin who is gay. She is a beautiful, loving, kind person. I don't understand how family members can say that they love her, yet still vote to deny her the right to marry the person she loves. I don't understand how a person can be pro-life, but be okay with taking babies away from their mothers at the border. I don't understand how you can strive to be Christ-like, yet treat immigrants and poor people as less than human. Or not want people to have access to doctors. Or not want children to have free lunches. I don't understand how you can live the values espoused in the bible, and vote for a man who lies, cheats, who never goes to church, who's never asked God for forgiveness. Donald Trump is the epitome of everything Jesus preached against. That says it all quite succinctly. *Regardless, it was our duty as citizens of society both to teach and to model Christian values and standards of conduct to the society at large. I have tried to be cautious and careful in my writing and I am not inclined toward the dramatic—but for the first time in my 82 years I am genuinely fearful about the upcoming election and what it could mean for our democracy. I do not think it is an exaggeration to suggest that this upcoming mid-term election is critical and that, if the opposition to Donald Trump is not successful in gaining control of the Congress, the survival of democracy and democratic values is in serious danger and we will face the political reality that fascism has emerged as a serious threat that has gained more than a foothold in our once great nation. If you doubt that, go back and read anew the history of Europe in the 1930s—the rise of fascism in Germany under Adolf Hitler and in Italy under Benito Mussolini; the call for national unity in the face of amorphous threats; the increasingly totalitarian one-party rule, suppressing voices of the opposition party, attacking or intimidating newspapers that did not support the ruling party; intimidation through threats and violence; demonizing opponents and the leaders of the opposition party as essentially evil; preparations for war and increased armaments and military spending; uncritical loyalty and devotion to the leader; repeated public lying by the leader under the premise that the lie that dominates the public discussion will become true for the masses by repetition; control of the message by the leader and his propaganda media that drowned out or sabotaged any competing voices; racism and fear of non-whites and those who are different in culture or language who will overwhelm us and pose a threat to our culture and traditions; the use of militarized police and chain link and barb-wire enclosures for holding those who must be forcibly removed from our nation. And so it goes. The legitimate press (disparagingly called “Fake News” by Trump and his fawning followers) has been frustrated by relentless attacks on press freedom and personal (often vicious) attacks on journalists and the threats that they pose both to democratic values and to a free and independent press. Those of us who care for democratic values, including the press, have been slow to call out Trump and the leaders of the Republican Party, for their complicity in undermining democracy and the fundamental principles of our nation. Until now. In all democracies, politicians occasionally lie to cover up scandals or exaggerate their legislative accomplishments. In the United States, the rise of the right-wing news media in recent decades has tempted politicians to play to their own supporters without worrying whether their rhetoric is inflammatory or fair. But the construction of an alternate reality that obviates the very possibility of conducting politics on the basis of truth is a novelty in this country. And it is increasingly becoming obvious that it will serve a clear purpose: to prepare the ground for egregious violations of basic democratic norms. In other words, lying creates an alternative reality that lays the groundwork in which fascism thrives. This upcoming election is nothing less than a referendum on fascism in the United States. Those who do not vote, or who vote for Republican candidates, whether or not they realize it, become complicit in the big lie, the potential loss of our democracy, and the move toward fascism. Crossing our border from far across the sea? We do not want them here. We have shut the door. even murderers do not endure. We will not keep track of where we send them. We will not facilitate your contact with them. We do not care if they are scared and lonely. We do not care if parents are worried. We do not care if the children are lost in the ICE bureaucracy. We are the US government. We are turning off the lamp. 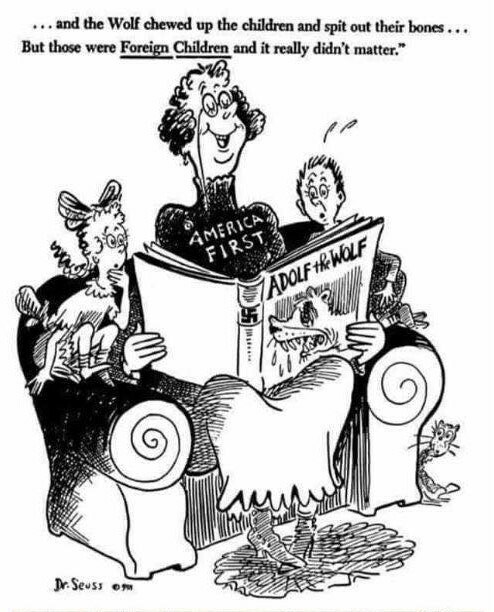 Actual Dr. Seuss cartoon from 1941. Used under "fair use" provision of copyright law. When Jesus said, as quoted in the Gospel of Mark in the translation known as the King James Version, “suffer the little children to come ...”* it seems obvious that he did not mean “make the children who come suffer.” Unfortunately Attorney General Sessions, in obedience to the wishes of his boss, seems to have misread his bible in such a way that he believes that it is his duty, in the name of all Americans, to inflict the maximum amount of suffering on the innocent children who cross the border illegally in the company of their parents, by ripping them from the arms of their parents and sending them to holding pens or detention facilities or to the control of contractors thousands of miles from their parents who have no idea where they are. Their tragic stories fill our newspapers, news sites and nightly television broadcasts, so there is no need to repeat them here. We hear our Attorney General and our President say callously that this cruel policy of separation of children from their parents when they cross the border illegally, and the detention of both parents and children under conditions that would be illegal if applied to criminals in our prisons, is intended as a warning to potential immigrants not to cross our borders or that will happen to them also. The United States throughout its history has welcomed immigrants. No more. There is no question that the immigration problem worldwide is out of control. Many countries in the world have become inhospitable places for their citizens and residents—due to war, terrorism, crime, drought and famine, civil disorder, inequalities and disparities in wealth, poverty and unemployment—consequently there has been a massive migration of people to western countries that typically have been sympathetic to immigrants. The receiving countries do not have the will or the resources to continue to absorb the hordes of those who are flooding over their often unprotected borders. The resulting backlash has set neighbor against neighbor in many countries around the world and in our own country it has led to the rise of Donald Trump, who campaigned on closing our country to new immigrants and expelling those who have come here illegally. As much as I dislike Donald Trump and his policies, which I strongly believe are destroying the traditional values that have made America great, are dividing Americans and are undermining our democracy, his policies have brought immigration policy to the attention of our political leaders. Our nation needs a sensible, realistic and enforceable immigration policy that limits immigration to numbers that can be accommodated and prioritizes entry on some rational basis and then administers its policies in a humane and respectful way. That said, the current Trump policy is cruel, inhuman, un-American, un-Christian and deplorable. It was devised to be cruel. It violates our sense of decency and our American values of compassion and rendering assistance to those in need. It is unnecessarily hurtful. It violates (for those of us who are Christians) our sense of Christian duty. I am not implying that the U.S. is a Christian nation, but I find it ironic that the Republican Party, that has always insisted that the U.S. is a Christian nation and that they were the party of family values should act in a way diametrically opposite to principles they say they espouse. Those who support, engage in, justify or assist this cruel and inhumane policy toward children and families are indeed deplorable. There is considerable reluctance both by the press and by our political leaders to state what has been obvious to anyone who has been paying attention--that Trump and his supporters have colluded with an enemy of the United States to undermine US interests, our elections and our democratic processes not only to win an election but to weaken the role of the US in international relations. There are implications of colluding with an enemy that our political leaders seem reluctant to state--Trump is a traitor. Trump is an inveterate and constant liar who has said one thing and done another (for instance, saying he would drain the swamp but instead appointing denizens of the swamp to major roles in his administration). His swamp dwelling cabinet officials are systematically weakening the US by rolling back regulations that protect our air, our water, our environment, our housing, our medical care, our social safety net--and systematically dismantling important government agencies from housing to education, the FDA to the Justice Department. He is actively undermining our quality of life, our educational system, our cultural values and our democratic institutions. More important he is a traitor in the traditional sense of subverting U.S. national interests in the service of a foreign enemy of the US. Despite his assertions that his collusion with Russia is "fake news" there is sufficient evidence publicly available to substantiate the claim that Trump and his co-conspirators had Russian help to win the election. Trump’s interest was to win at any cost and the Russian interest was to subvert the U.S. democratic processes, weaken the NATO alliance and sow discord among the European democracies and within the US—all of which is very clearly substantiated by US and European intelligence agencies. The latest instance of Trump acting in the service of a foreign power and against the interests of our own nation is his unilateral termination this week of the US commitment to the agreement with Iran that limits its ability to develop a nuclear weapon and provides for monitoring of its nuclear sites to assure compliance. It is in our interest to keep that agreement in place because it reduced the potential threat to Middle East stability. Arguably it is in the interest of other powers in the region, including Israel, because it reduces tension and could lead to a settlement of the Arab-Israeli conflict. Unfortunately the right-wing government of PM Netanyahu does not want peace yet because it has not yet achieved its ultimate goal, which is control of all of the land area of biblical Israel and the displacement or subjugation of the Palestinians from their land. Why does withdrawal from the nuclear agreement with Iran serve Israeli interests? For two apparent reasons. 1. It angers Iran, which will then find reasons to increase tensions that could result in a larger conflict, possibly even war between Iran and Israel. Israel expects any such war would involve the US. Israel hopes that will result in the defeat of Iran, to prevent a future Nuclear-armed Iran, and to reduce the power of Iran as a force that could threaten Israel's future. 2. By increasing regional conflict and tensions it provides an opportunity for Israel to increase the amount of land it is steadily incorporating into Israel while justifying the land grab as necessary for regional peace. Why is Trump betraying US national interests in the service of Israeli policy? The U.S. has been sympathetic to Israel since its creation ex nihilo out of Arab owned land in Palestine. We get it. There was sympathy for the Jews as a result of the Holocaust. We have not forgotten. But that was more than 70 years ago and the history of Israel in recent years has been less than admirable. Israel has refused to acknowledge any injury to the Arab occupants that they displaced to create Israel, refused the right of Arabs to return to their homeland even as immigrants, and under recent right-wing Israeli governments especially that of Netanyahu have created new settlements and refused the right of Palestinians to their own state. Those Israeli policies have been opposed by every other nation in the world as unreasonable, unlawful and unacceptable, and the US has been caught between its desire to support Israel while telling Israel that its policies were troublesome. Unfortunately US policy has been undermined by two different groups in the US who have supported Israel’s troublesome attitude: (a) American Zionist Jews, and their supporters in Congress and (b) Christian Zionists, each with its own agenda and rationale, but cooperating in the demand that the US support Israel’s expansionist land policies and its historic right to biblical lands, and continuing to support Israeli foreign policy no matter that it is not in the best interests of the US. Israel defines its national interest as (a) expansion of Israel into Arab lands and creating one state in the territory that was formerly Palestine; (b) claiming Jerusalem as capital of that expanded Jewish State with no recognition of the rights of Christians (since medieval times) or of Palestinians (since the Muslim era, if not to biblical times) to share in that symbolic capital of three major religions and peoples; and (c) no regional power strong enough to counter Israeli military power. The Middle East has been a trouble spot in the world for generations and seems always a tinderbox ready to erupt in flames. In the nuclear age that has become a danger that needs to be managed. Israel reportedly has nuclear weapons. Iran seems to have emerged as a force to be reckoned with, causing Israel to fear Iran getting a nuclear weapon, which would make the outcome of any war between Iran and Israel uncertain but possibly leading to the destruction of Israel. The US, together with the western nations of the NATO alliance, fear Iran getting a nuclear weapon because it could lead to unforeseen but troublesome problems in that entire region, given the Islamic potential for suicidal actions. Whose interests are served if the US pulls out of the nuclear non-proliferation agreement with Iran? Certainly not US interests. The US gains nothing by a war with Iran. The rest of the world? Surely the rest of the world’s nations see nothing to gain by war. Israel’s interests? Of course. Israel is the elephant in the room. By supporting the interests of Israel against the interests of his own nation Trump is committing treason. I am prepared for criticism from the right that this article is anti-semitic but my bona fides on this issue are pretty clear and longstanding. I was a supporter of Israel in its early days when it faced annhilation at the hands of various mid-Eastern powers, and I continued to support it throughout its early development until it began its current expansionism with a claim to all of the biblical lands of 3000 years ago under the preposterous theory that these were lands granted to Abraham by God and thus to Israel and that any legal claims had to give way to theological justification. The current US interest in the Middle East is to contain Iran and divert its energies into peaceful projects and away from terrorism, trouble-making and political isolation. Together with our allies the US entered into the agreement with Iran to curtail its nuclear weapons program. Israel has different national interests than the US--in the service of which Israel has been successful in convincing Trump to pull out of the nuclear agreement and is pushing Trump to take military action against Iran. The US withdrawal from the agreement is likely to push Iran to do something troublesome, which will give the US pretense for a military strike against Iran, which is what Israel wants. Our principles as Christians and as Humanists compel us to oppose vociferously any US involvement in a war against Iran whose objective is to assist Israel in its unjust and illegal seizure of Palestinian lands (including the city of Jerusalem). Democracy is often messy and noisy, no more so than now. Democracy implies a battle of ideas, a struggle with competing political and social values, but the customary historical norms have dictated that we are at least civil with each other. No longer do we discuss the great ideas with calmness and rationality, attempting to persuade by arguments supported by facts. I am afraid that civil discourse may be a relic of the past, no longer observed by the shrill purveyors of half truths, distortions and outright lies that emanate from the Trump camp and its supporters on right-wing media. I’m old. I admit it. I look back nostalgically to a time in which the concept of truth was respected, when no matter what your political position was, we understood what truth was, we talked about facts, and we understood that facts were representations of a reality of sorts. We could agree what facts were because we were grounded in the same reality. We understand what it means to be a Christian. While we may disagree about whether a Christian had to believe certain things, there is no disagreement about what it means to be a Christian, what values a Christian exemplifies in his life and behavior and attitude. Jesus is our model of what it means to be a Christian--it means at the least feeding the hungry, housing the homeless, healing the sick, supporting the poor, comforting the lonely, seeking peace and standing with the powerless against the mighty. Those are not the values of the leadership of our nation. The policies our nation espouses now are inconsistent with the traditional values of our nation; to the contrary, our national values, at least as represented by our President and the Republicans who hold the power, not only are not Christian, they are actively and virulently anti-Christian. This article in the Boston Globe entitled “Are Trump Christians Really Christian?” makes a strong case backed by leaders of Catholic, traditional Protestants and even some Evangelicals, that you cannot follow the teachings of Trump and the opposing teachings of Jesus, at the same time. The people and the churches that are serious about being Christians are faced with a choice as to which master they will serve. How times have changed in our nation's halls of power. There was a time that some of us fondly remember when we as a nation fought a war against poverty. With the arrival of the Trump Administration, our nation's lawmakers have decided that our national resources should be expended on a war against the poor. We could cite numerous examples, but an opinion piece by Dana Milbank in the Washington Post about Paul Ryan's firing of the House of Representative's chaplain for his prayers for the poor and the defenseless nicely summarizes why current administration supporters want Reverend Patrick Conroy silenced. What the Senate Chaplain said in his prayers got the right wing angry becaused it showed their hypocrisy. We know this much: Ryan’s office complained to Conroy about a prayer he offered on the House floor during the tax overhaul debate that those who “continue to struggle” in the United States would not be made “losers under new tax laws.” Ryan admonished the priest after the Nov. 6 prayer, saying, “Padre, you just got to stay out of politics,” Conroy told the New York Times. Only in this perverted time could a priest lose his job after committing the sin of crying out for justice for the poor. But then, look around: Everywhere are the signs of a rising kleptocracy. The $1.5 trillion tax cut did make winners of corporations and the wealthy. And actions since then show that the Trump administration is making losers of the poor. Speaking truth to power has always been dangerous, but it is more so when it confronts the most powerful political forces in our nation on a daily basis in the corridors of power. This is what Jesus did and look what happened to him, so should we be surprised at what happened to Father Conroy? Should Christians acquiesce when power exerts itself against compassion and justice?